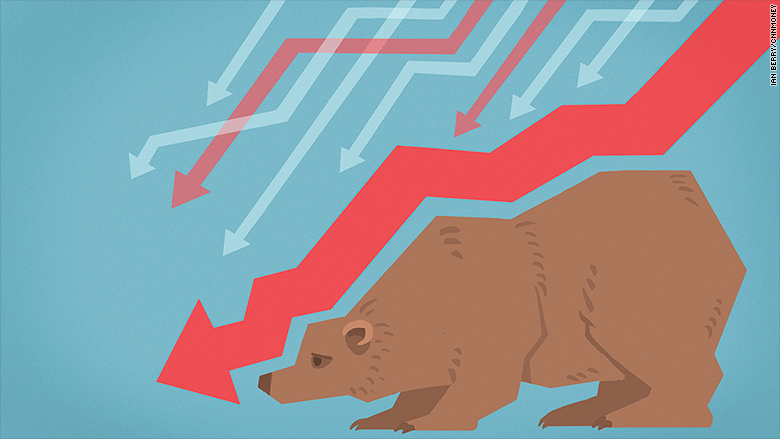 Many fear the stock market is nearing a new bear market. In reality, many stocks are already living that nightmare. There hasn't been a bear market in the U.S. since the Great Recession. And even after the atrocious start to 2016, Wall Street isn't close to a bear market. The major indexes have to plunge 20% below their previous high to be in one. The S&P 500 is down about 9% from its record highs of last year. The Dow and Nasdaq were down 10% from the highs on Thursday, officially falling into "correction" mode. But lurking beneath the surface, the picture looks a lot worse. As of Friday nearly half -- or 229 -- of the stocks in the S&P 500 have crumbled at least 20% below their 52-week highs, according to FactSet data. They include stocks rocked by the oil crash like Chesapeake Energy (CHK) (down a stunning 77% from its high) as well as better-known names like FedEx (FDX), Goldman Sachs (GS) and Priceline (PCLN). "So many things are breaking down that the chance of the overall market breaking down is higher than at any time in several years," said Ryan Detrick, an independent market strategist. So why aren't the broader indexes reflecting the underlying pain? First, Netflix and other beloved stocks like Facebook (FB) and Googl (GOOGL)e have held up better than the rest of the market. That counts for a lot considering those three companies are now worth a stunning $831 billion. But look at the signs of weakness in the broader S&P 1500, which includes small, medium and large-cap companies. The average stock in that index is down 25% from its high as of Friday, according to Bespoke Investment Group. Small-cap stocks -- which are seen as more dangerous than their larger cousins -- are clearly getting hit a lot harder. The average small-cap stock is now down nearly 30% from its peak, putting it firmly in bear-market status. "A lot of people are worried so they are dumping the riskier names. By nature, that's the small-cap world," said Detrick. And then there's energy. The dramatic decline in crude oil prices rocked the energy space. The average energy stock is now down a whopping 52% from its 52-week high, according to Bespoke. The only thing worse than that is small-cap energy, which is down 61%. "The two main themes are weakness in small caps and energy. If you are a stock that fits both of those criteria, it has been deadly," Bespoke wrote in a report. No need to tell that to shareholders in small-cap energy names like Rex Energy (REXX) and Bonanza Creek (BCEI), which are down an incredible 80%-plus from their highs. The problem is it takes time to repair the technical and psychological pain inflicted when a stock falls into a bear market. That pain can also fuel selling in unrelated stocks as investors are forced to raise cash to cover their losses. It's no wonder billionaire George Soros and others are saying the present situation reminds them of 2008, the worst of the last bear market. Of course, the major difference now is the U.S. economy seems to still be humming along -- despite the turmoil in China. On Friday the government said the U.S. added nearly 300,000 jobs in December. That hardly signals recession. "I don't see another bear market. The true bear markets happen when the economy goes into recession. This economy is not falling off a cliff," said Detrick.